Common mullein, Aaron's rod, Adam's flannel, blanket leaf, bullock's lungwort, caldlewick, cow's lungwort, feltwort, flannel leaf, flannel mullein, flannel plant, great mullein, hare's beard, hedge taper, ice leaf, Indian tobacco, Jacob's staff, Jupiter's staff, lady's foxglove, mullein, mullein dock, old man's flannel, Peter's staff, shepherd's club, torch-wort, velvet dock, velvet plant. A tall, weedy, unbranched, biennial that grows to 7 feet in height. It is hairy and soft. Leaves are widely oblanceolate and oblong 2 to 12 inches long. 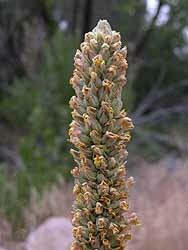 Flowers are yellow, densely arranged along a terminal club-like spike. Fields, rocky or gravelly banks, waste lands, roadsides, embankments, pastures, and meadows. The leaves and flowers are classed as astringent, antitussive, respiratory sedative, antifungal, and anodyne. A tea made from the leaves is used in Appalacia for colds. The Greeks and Romans dipped dried stalks in was and used them as candles. The Spanish people of New Mexico smoked the dried leaves, wrapped in corn husks, as a treatment for asthma.